Paige Van de Sype (left) and Kayla Romanow (right) competed in the Walsh Family Law Moot in Toronto. The College of Law is responding to the growing need for lawyers trained in family law negotiation skills. 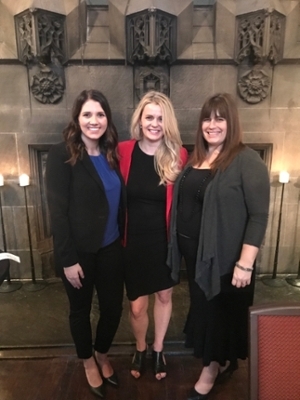 Romanow, Van de Sype and Panko at the Walsh Family Law Moot in Toronto. This year, thanks to sponsorship from the Collaborative Professionals of Saskatchewan (CPS) and the Alternative Dispute Resolution Institute of Saskatchewan (ADRI SK), a team from the University of Saskatchewan (U of S) competed in the Walsh Family Law Moot for the first time. The team of two students, Paige Van de Sype and Kayla Romanow, gave a strong performance to place fourth overall in the competition. Mooting is a great opportunity for law students to explore the skills and roles that they will use as lawyers, in different simulated legal scenarios. It also gives them a chance to practice their dispute resolution skills outside the classroom. Family law differs from most other areas of law, in that the clients share an emotional history and relationship that is likely to continue. Children are frequently at the forefront of complex disputes, and there is a lot at stake. Families are not well-served by an adversarial court system which doesn’t account for emotional relationships. What’s more, access to justice is tough for those who don’t qualify for legal assistance and can’t afford a lawyer, with a high proportion forced to represent themselves in a legal system they don’t understand. “The cost of litigation to families in terms of time, money, and relationships can be devastating,” said Léa Lapointe, a family law practitioner in Saskatoon. For these reasons, family law lawyers are looking increasingly to dispute resolution methods that keep families out of court. One such technique is collaborative practice, where families can work with child development specialists, separation coaches, and financial specialists in addition to lawyers, to develop solutions that benefit everyone. 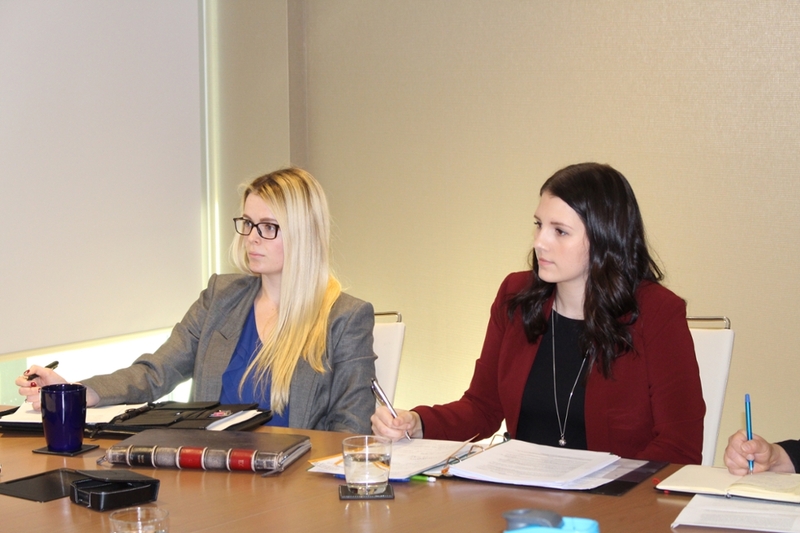 Romanow and Van de Sype attend a training session with CPS ahead of the moot competition, at the offices of McDougall Gauley LLP, Saskatoon. The Walsh Family Law Moot exposed students to interest-based negotiations among other dispute resolution methods - a clear benefit, according to sponsors CPS. A new study by the Canadian Research Institute for Law and the Family found that in resolving family disputes, the majority of lawyers prefer methods such as mediation, collaboration and arbitration over litigation. It also revealed that almost all lawyers surveyed thought families should go down the dispute resolution route before litigating, with three-quarters saying litigation should only be used as a last resort. Findings such as these highlight the importance of negotiation in a lawyer’s work, a fact which is reflected in the College of Law’s strong dispute resolution program. This year, a new class is teaching students to apply negotiation skills in a family law context, and to think critically about what their clients need. According to Panko, who is teaching the class, negotiations have to take place with the long-term in mind. Moving forward, lawyers have a crucial role to play in changing the landscape of family law, and making it resolution-centred. Article re-posted on 2-Apr-2019 5:11:17 PM .